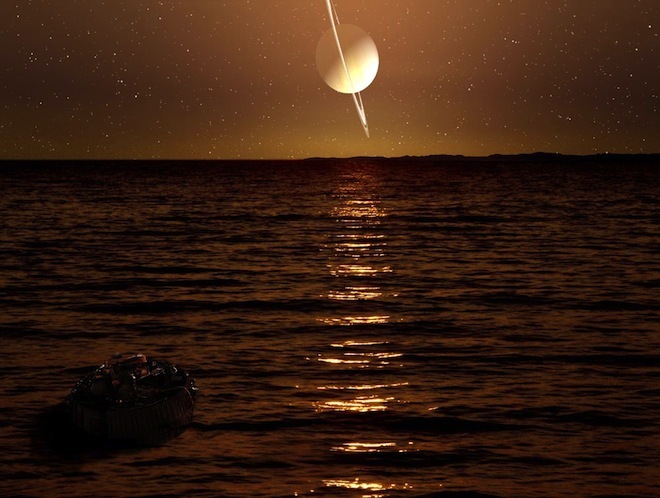 For a long time researches observing the Saturn and its system of satellites, and came to a conclusion, that liquid lakes on Titan can dry up completely. The American Kassini spacecraft and its onboard scientific tools long time investigated the largest satellite of Saturn – the Titan, which is known that is the only heavenly body in our Solar System, without considering our own planet, which has liquid on the surface. Notorious lakes on Titan play on this natural satellite the same role, as water on Earth. Methane on the Titan takes active part in liquid circulation. It evaporates, and then drops out in the form of a precipitation. Everything happens practically just as and on Earth to water. Recently, scientists came to a conclusion, that on the Titan is not only methane, but also ethane, which evaporates not as rapidly as methane, but also it can not help the Titan, with preservation of its liquid on a surface. By estimates of scientists of team of the American Space Agency NASA, relatively soon methane – ethane lakes on Titan can dry up completely and it will lead to considerable changes of conditions on the Titan. On this largest satellite of Saturn there can soon come a drought. Earlier was considered, that the size and volume of liquid lakes on Titan is quite stable, but now scientists of NASA recorded some changes in these indicators. It was noticed, that methane -ethane lakes gradually after all dry up, decreasing in a size and volume. Further researches have to show, how soon liquid can evaporate completely from a surface of the Titan.